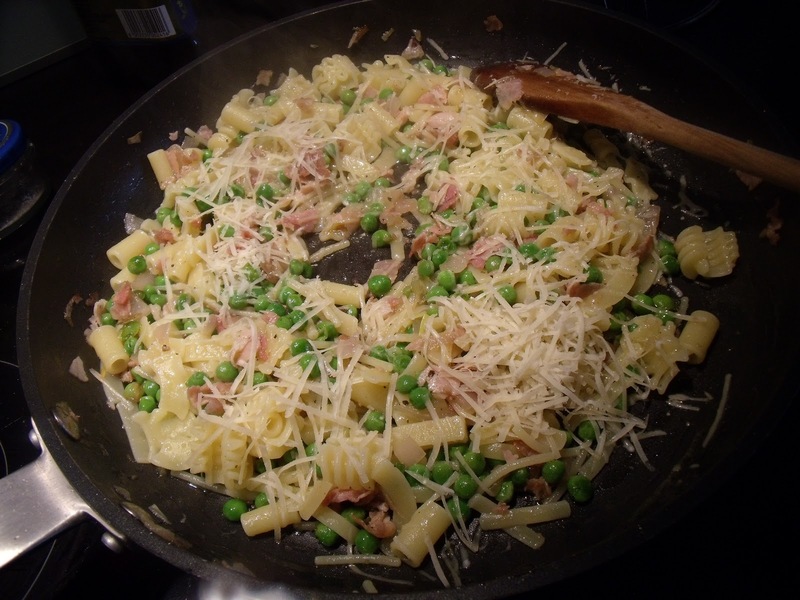 I remember my mom saying that when she was a child, her mother prepared certain dishes on each day of the week, and Wednesday was the day for Pasta e Piselli. I don't have any pattern to my daily menus, although I admit it would make life so much easier!! I keep promising myself to try to be more organised but I cannot seem to shop with a list in hand! For a couple of years when I lived in Lakewood, NJ, I used to go grocery shopping with my friend Joyce. She was super organised! She had a list and coupons for many of the items on her list! I did coupon and shop with a list during those years because... with the money saved couponing Joyce and I would go out to lunch at Friendly's! I need incentive.. I always have!! 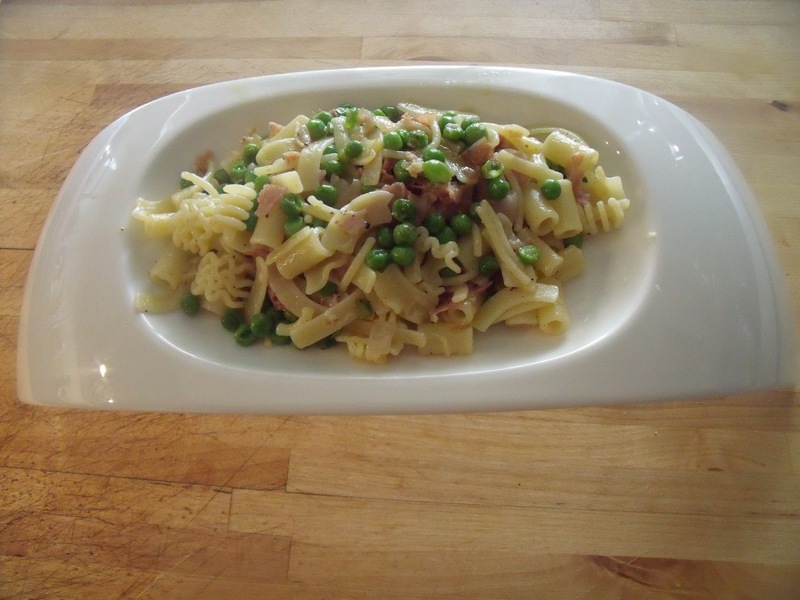 Pasta and peas is very easy to prepare and it's a good way to get kids to eat peas! 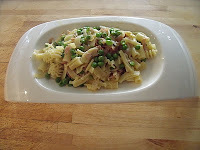 3 to 4 oz of pasta - the best choice would be small shells, but I used a mix of small pasta shapes. 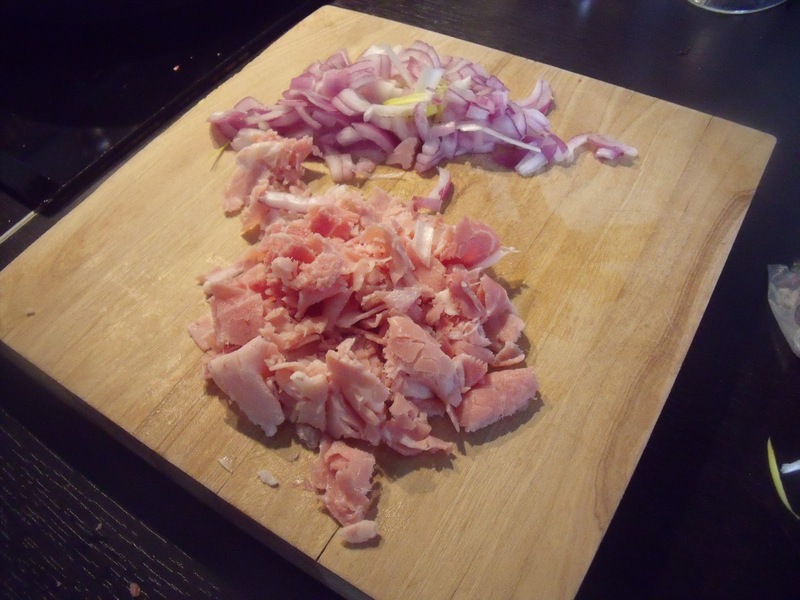 Coarsely chop the onion and ham. 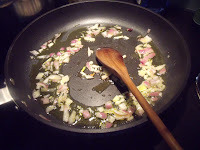 Sauté the onion in a couple of tablespoons of extra virgin olive oil. 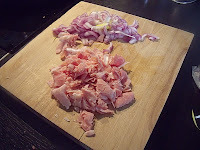 When the onion is translucent add the ham and cook together for a couple of minutes. 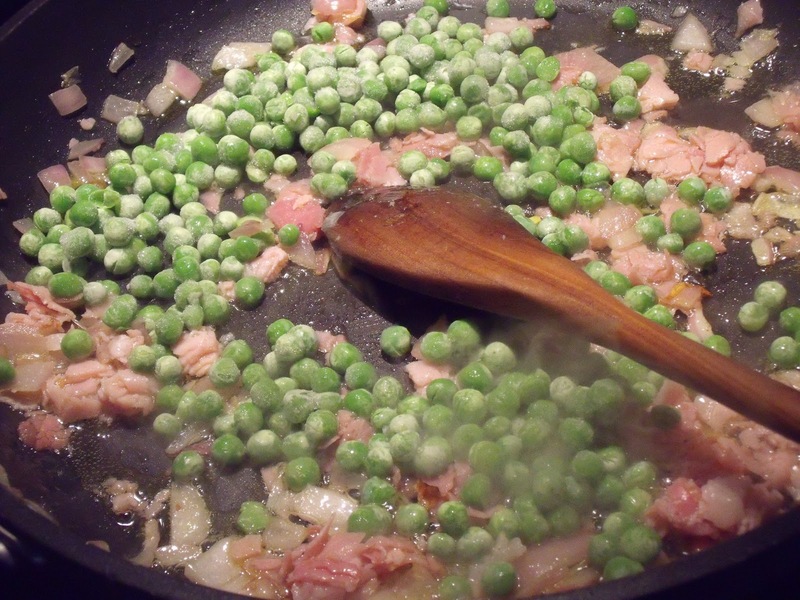 Add the frozen peas and some of the boiling water from the pasta pot. Check for seasoning. 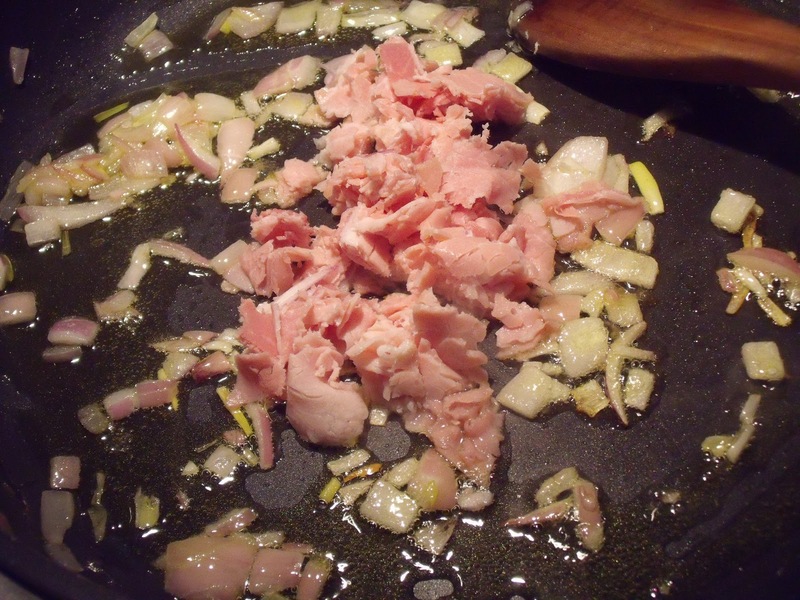 Depending on the type of ham you use, you may not have to add any salt. Do add some freshly ground pepper! I like pepper and use lots of it! 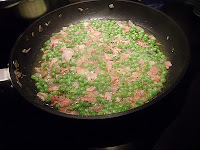 Lower heat to simmer. 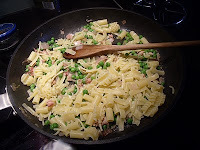 By now the water is boiling so salt it and put the pasta in to boil. (p.s. 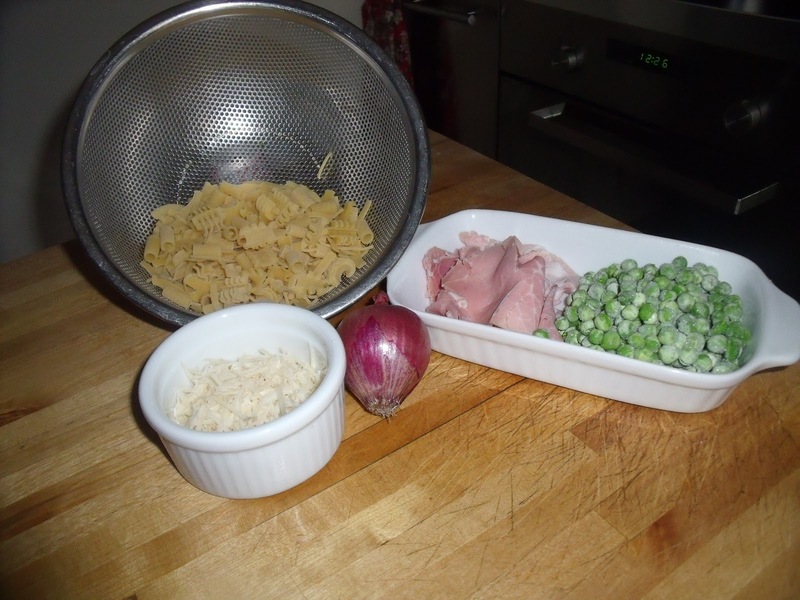 you may also use cooked rice in this recipe). While the pasta is cooking, check the peas, ham and onions. By now most of the liquid should have evaporated. I like mine on the dry side, but if you like a more soupy sauce, you can simmer the peas, ham and onions with a lid on the pot to conserve the liquid. When the pasta is done the way you like it, drain and add to the pan. Toss to mix and add the grated cheese. Toss again and that's it! Serve piping hot! and... as Julia Child would have said had she spoken Italian... BUON APPETITO! This looks delicious Donna. I wish I was there in your kitchen. Hope all is well. Only thing I miss about FB is you. Really enjoying your blog though.